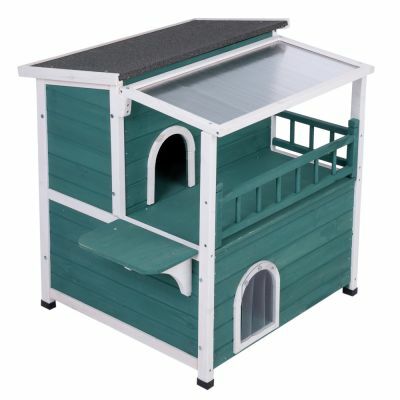 Cat House with Sunroof | Free P&P on orders £29+ at zooplus! 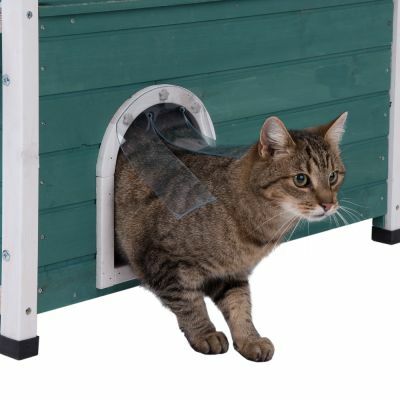 Cat house :"Fantastic delivered very fast... All built very easy me and my 6yr old grandson built it looks lovely... Just got to get the cats to go in it now"
Add a touch of southern flair to your garden, patio or home with this Cat House with Sunroof. 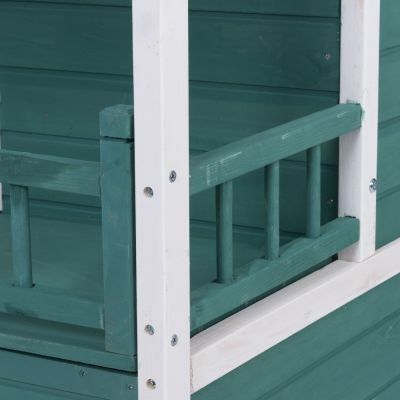 It features a green and white lacquered façade, with a linear two-storey design and a cute veranda, giving the Cat House with Sunroof the look of a Mississippi house. 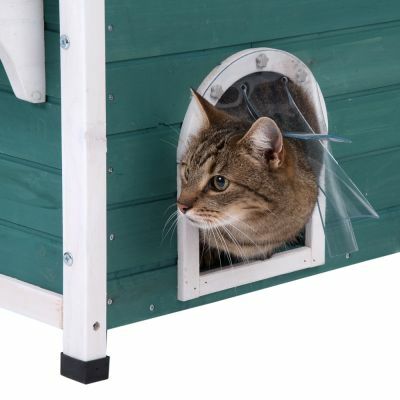 In cat size and designed to boost your pet’s wellbeing, it offers a cosy hideaway. The lower storey is a den from relaxing and sleep. The veranda on the upper storey offers a great space of watching the world go by, sunbathing and generally lazing around. 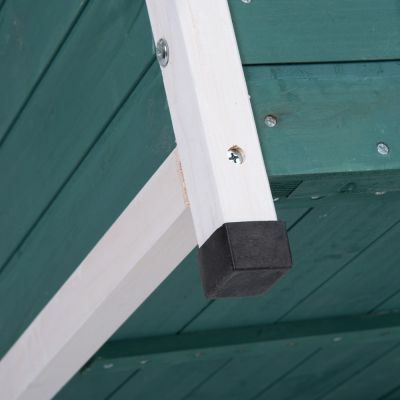 The weatherproof roof features two sections. 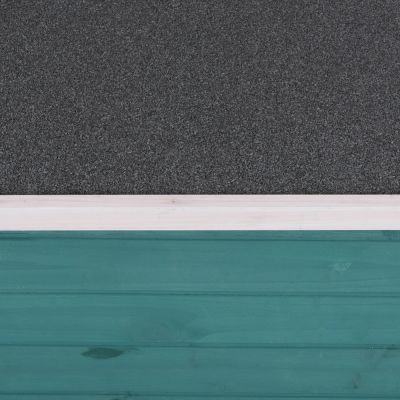 One side is coated in robust asphalt, reliably protecting the Cat House with Sunroof from rain and acting as a great lookout platform in good weather. The other half is over the veranda, with a transparent plastic sunroof. 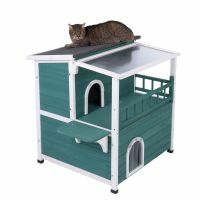 This allows your cat to take in some heat without being in direct sunlight. 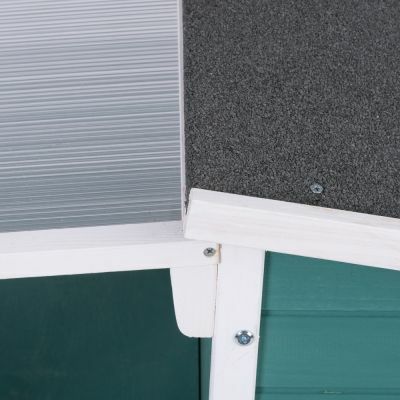 When the weather is poor, the door with plastic slats will come in handy for protecting the ground floor against wind and cold. 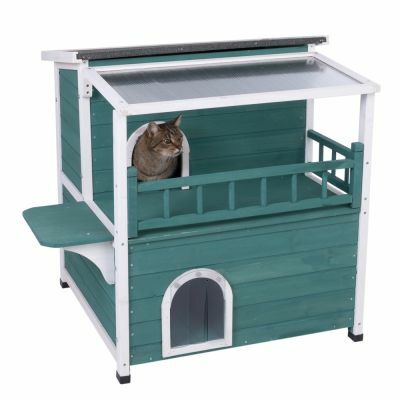 The feet have extra plastic caps, which protect the Cat House with Sunroof from damp. 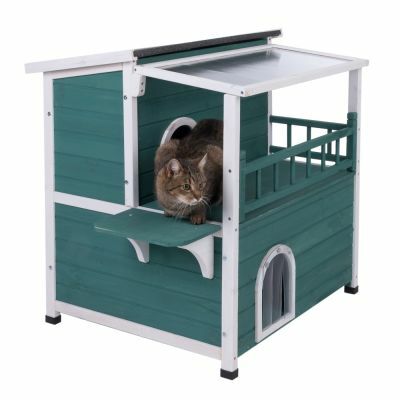 No matter whether you use the cat house in the house or the garden, it is perfect all year round and offers your cat its own special space in an adorable American design you will both love! 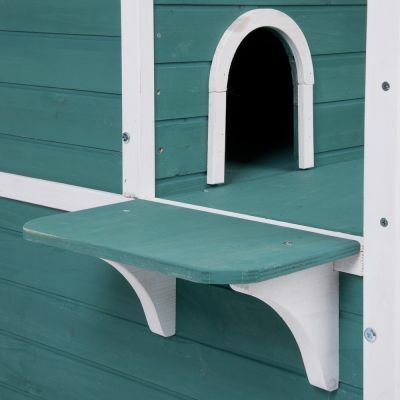 Please note: It is important that wooden cat houses are cleaned and treated regularly otherwise the wood may dry out, become brittle or warped or start to look unsightly. 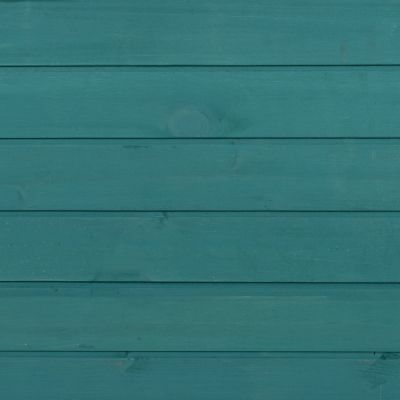 We recommend applying further coats of wood preserver if the cat house is to be left outside. Please make sure that you use non-toxic products. 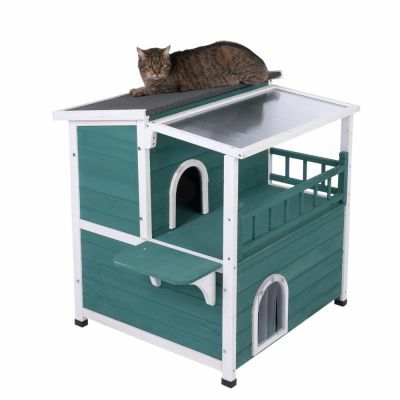 To make sure your cat house stays looking good, it is a good idea to position it in a protected area which is not exposed to the elements. 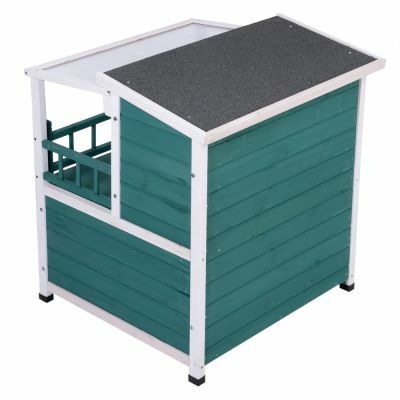 This is a lovely house, good build quality and easy to put together thanks to the clear instructions. The main issue is that it's quite difficult to access the internal areas without taking it apart. If you cat deposited something in there you'd probably never know until it started smelling bad. It's also tricky to add/ check/ remove bedding, which you really need as the floor on the bottom has gaps in it. I would buy another but would probably look to modify it with a hatch at the back. Received quickly and my cats loved it at once. They two floors are big enough for 3 cats (7 months). I put it on a garden table on our covered terrace to keep it away from our dogs..... Very happy with this pretty little house. My stray loved it right away! He was curled up both on the terrace and inside (on the upper level) within just a few minutes. It has a solid and comfortable appearance. Excellent value for money. The house was super easy and quick to assemble, I've very excited so far. Looks nice, smells nice of course. Price/performance fit well. Unfortunately the cats have not yet accepted it - although they usually climb into every cupboard, they do not want to go into the cat house... Hopefully that will change soon. Otherwise, I can only recommend it. I am very satisfied with my purchase. The small house is exactly like the photo on the website. The indoor spaces are spacious for cats, I think two of them can even get in a compartment at the same time. I was looking for a product that would work in both winter and summer. Definitely perfect for the winter - I have put cushions in and now it's really cosy. Love the colour.